Fluid Floors recommends our Acrylic Floor Cleaner, specially manufactured for all our resinous floor systems. It is a general purpose cleaner suitable for most cleaning requirements. 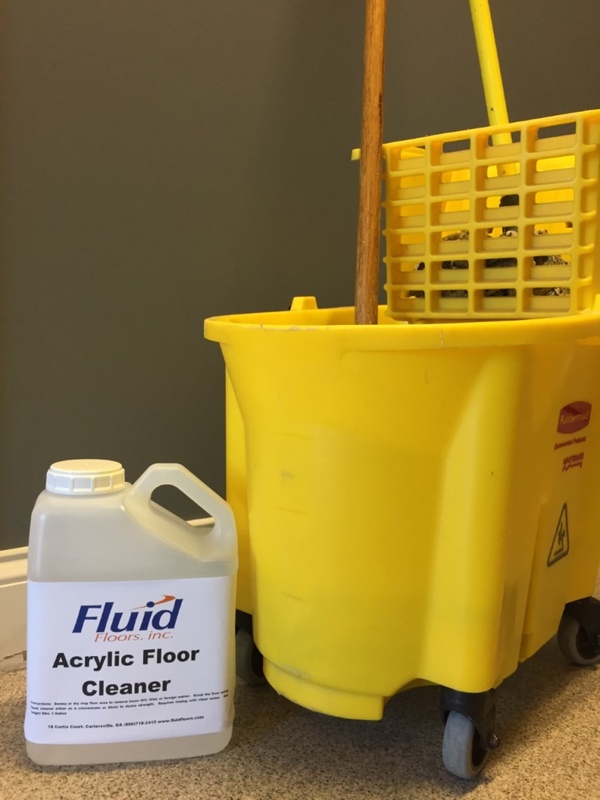 Fluid Floors Acrylic Floor Cleaner is citrus based. In addition to cleaning your floor, it will bring shine and look brand new again. What type of debris is deposited on the floor? In an oily environment, degreasers are effective. Caustic cleaners are appropriate where food acids are present, etc. What cleaning chemicals can be used without damaging the floor? Our floor systems exhibit excellent resistance to diluted acids and caustics. They should not be exposed to organic solvents. Caustic cleaners and those based on citrus (Acrylic Floor Cleaner) or other “green” cleaners are acceptable. Any cleaner that lists a solvent on the label or SDS Sheet should be avoided.